Provide comfort for the family of Richard Peters with a meaningful gesture of sympathy. RICHARD PETERS, 84, of Jackson Twp., NJ, passed away on Monday, January 21, 2019, at Monmouth Medical Center, Southern Campus, Lakewood, NJ, surrounded by his loving family. He was born in Newark, NJ, and resided in Jackson Twp. for 20 years. Richard was a United States Veteran, proudly serving his country in the Air Force. Richard was a member of the Elks. He treasured the friendship of his card and golf buddies and his cat Petey. Richard was an avid golfer and New York Giants fan, but above all, he loved his family and grandchildren endlessly!!! He was predeceased by his parents, Stephen and Anna Peters. He is survived by his loving wife of 47 years, Frances; his daughters, Kimberly Mazauskas of Boca Raton, FL, Karen Crisafi and her husband, Frank of Brick, NJ, Kathleen Nieves of Rahway, NJ, and Kristine Faiella and her husband, Thomas of Tinton Falls, NJ; and by his grandchildren, Lacey and Jaclyn Mazauskas of Boca Raton, FL, Nicholas and Christopher Nieves of Rahway, NJ, Kristie, Frank and Karlie Crisafi of Brick, NJ, and Nicole and Alexa Faiella of Tinton Falls, NJ. Relative and friends are respectfully invited to attend his visitation from 2-4 & 6-8 PM on Thursday, January 24, 2019, at the GEORGE S. HASSLER FUNERAL HOME, 980 Bennetts Mills Road, Jackson Twp., NJ. A funeral gathering will be offered at 8:30 AM, on Friday, January 25, 2019, at the funeral home. His funeral liturgy will follow at 9:30 AM, at St. Aloysius Roman Catholic Church, 935 Bennetts Mills Road, Jackson Twp., NJ. Interment with Military Honors will be offered at 10:00 AM on Monday, January 28, 2019, in Brig. Gen. William C. Doyle Veterans Memorial Cemetery, 350 Provinceline Road, Arneytown, NJ. Please gather at 8:45 AM at the funeral home. If so desired, contributions may be made in Richard’s memory to St. Jude Children’s Research Hospital, 501 St. Jude Pl., Memphis TN, 38105-1492 and would be greatly appreciated. For directions, further information and to send condolence messages to the family, please select a tab on the left. Funeral gathering at 8:30 AM at the funeral home. Chapel Service with Military Honors at 10:00 AM on Monday, January 28, 2019. Please gather at 8:45 AM at the funeral home. 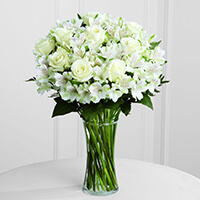 Consider providing a gift of comfort for the family of Richard Peters by sending flowers. Gregg, Sue, Gillian and Mike Dunleavy sent flowers to the family of Richard Peters. Our love and prayers are with you all at this time, and we will continue to pray for your peace. Gregg, Sue, Gillian and Mike Dunleavy purchased the The FTD Cherished Friend Bouquet for the family of Richard Peters.